Across Hawaiʻi, 28 charter schools with varying missions and educational methods provide their community with choices that complement the state Department of Education’s traditional public schools. As public schools, they are tuition free and students are admitted on a space-available basis. Five DOE schools have converted to charter status; state law permits up to 22 more to opt for the increased educational, organizational and fiscal flexibility of operating under contract. Another 23 Hawaiʻi schools are start-up charters; more than half have a Hawaiian cultural focus and 5 are immersion schools, delivering instruction solely in the Hawaiian language (see list). Much of the secret to a successful charter school is simple, says Keola Nakanishi, executive director of Oʻahu’s Hālaū Ku Māna school: "aloha; small classes; knowing your community, ʻohana and ʻōpio (youth) well; passion and innovation." But it also requires adequate resources, and Nakanishi is among those who say charters haven’t received their fair share. "The state has an opportunity to look at charter schools as a youngster who has started out on its own and needs some help," says Robert Fox, chair of University of Hawaiʻi at Hilo’s Department of Physics and Astronomy and co-director of the University of Hawaiʻi Charter School Resource Center. "Most people in Hawaiʻi who are in a place of authority, such as those in the legislature and the executive branch, might benefit from taking the time to see what charter schools do, what they can do, what their strengths and weaknesses are and what they need." In 2007 the Hawaiʻi Legislature delegated authorization and monitoring of charter schools to the Charter School Review Panel, whose members are appointed by the Board of Education. UH Hilo Professor of Education Nina Buchanan chairs the panel. She says it is a painstaking process to create policies and procedures that will allow Hawaiʻi’s diverse charter schools to maximize their freedom while demonstrating accountability and academic success, curricula and student composition. Schools range in size from Kauaʻi’s 32-student Ke Kula Niʻihau O Kekaha immersion school to the 694-student Myron B. Thompson Academy, which calls the Internet its campus and allows students to commute via school-issued laptop computer. Other schools include UH-affiliated laboratory schools (see profiles); West Hawaiʻi Explorations Academy, founded in 1994 in partnership with the Natural Energy Laboratory Hawaiʻi Authority as a school within Konawaena High School; and Honolulu’s Voyager School, which touts itself as an incubator exploring methods of teaching, testing and learning. "I have been working with the West Hawaiʻi Exploration Academy for a number of years developing a critical thinking assessment that we hope to validate," Buchanan says. Quantitatively, Hawaiʻi charters do not show a marked difference compared to standard DOE schools on standardized test scores. Buchanan isn’t alone in suspecting that standardized tests don’t measure skills such as oral communication, self-initiatives and critical and creative thinking. "Many charter schools are working to measure more accurately what students know and can do. But it will take time," she says. "In Hawaiʻi, charter schools have become a vehicle for Hawaiian culture- or language-focused instruction" she adds. "They also present an opportunity for dedicated educators to create curricula to promote learning for a variety of students whose needs weren’t being met in traditional schools. Hawaiʻi charter schools can be run locally using new administrative and governance structures that can target school resources and operate facilities more efficiently." The review panel requires each charter school to evaluate and document its programs and progress and resolve issues or concerns that could jeopardize its charter standing. Balancing the school mission with state and federal curriculum requirements—including No Child Left Behind directives—tests even the most successful charter schools. Kamuela charter school Kanu ʻo ka ʻĀina’s most recent self-evaluation, covering 2004-2005, exudes Hawaiian pride. Although noting that seventh- and eighth-grade students fell below the average in standardized math tests, it reports that three of Kanu’s four 2005 graduates entered college. About one in four Native Hawaiians enrolls in college, compared to one in three residents statewide, and a large number drop out before earning a bachelor’s degree, the evaluation notes. "Fewer than 1 in 20 graduate students in Hawai’i are of Hawaiian ancestry. This significant under representation makes the acceptance of a Kanu graduate into the master’s program in English language and literature at UH Mānoa a truly exhilarating event." "How much credence should the education system give to choice and sense of ownership and satisfaction?" Fox asks. When it comes to improvement, Hawaiʻi is encumbered by its massive school system—the only statewide system in the country, he says. "There are parents who clearly take the view that they don’t have time to wait." Adds Nakanishi: "It is easy to speculate that the more the mainstream schools are not performing, the more there will be motivation and demand for other options, but even if Hawaii mainstream schools were top of the line, charter schools would still be important, to allow space for innovation and community-based education." 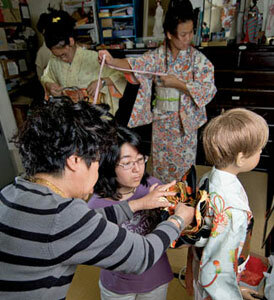 UH Mānoa’s Education Laboratory, arguably the charter in highest demand among Oʻahu families, has history on its side. "We’ve had a 40-year experiment learning how to provide a high-quality, challenging curriculum in which all students succeed regardless of family income, perceived ability or ethnicity," says Donald Young, director of the parent Curriculum Research and Development Group. "100 percent of our students graduate, 98 percent go on to some form of post-secondary education and the diverse student body consistently performs well on state achievement test scores." All charter schools are, more or less by definition, experimental and non-traditional. As a reform movement, experts say, they may not achieve full maturity nor yield high success rates until they’ve been in operation for 10, 15 or even 20 years. Chartered in 2001 as The Education Laboratory: A Hawaiʻi New Century Public Charter School, the institution widely known as University Laboratory School has been part of the University of Hawaiʻi since 1931, when the Territorial Normal and Training School merged with UH, creating the College of Education. By 1948 the school was conducting classes for children grades K–12, and since 1966 it has served as laboratory for the university’s Curriculum Research and Development Group. Located across University Avenue from the main Mānoa campus, the school is a scatter of antiquated buildings with parched grounds but fertile minds. Its students, who mirror a cross section of Hawaiʻi’s population, benefit from gaining friends they might never have encountered in their district public school. "It’s a school not like any other school, yet like every school," says CRDG Director Donald Young. "We strive to have a representative student body so that we know that what we learn here will also work well with students elsewhere in Hawaiʻi." Students who would normally attend a DOE school come from their home communities to be educated here, says Principal Frederick Birkett, who previously led Lanikai Charter School. "We are able to do more for these students because the environment is smaller and intimate. It has focus and purpose." There are 10 children in each of grades K–5 and 52 students per grade in 6–12. All but 2 of the 49 seniors in the class of 2007 enrolled in college. Asked to rate the quality of instruction they received, the seniors awarded positive scores, with highest marks for English, music and art. What happens in the school doesn’t stay in the school. "Through the Laboratory School, we have produced exemplary programs in science, math, social studies, English and other areas that are used in public and private schools in Hawaiʻi, nationally and internationally," Young says. "Our R&D activities impact teachers and students all over the world." 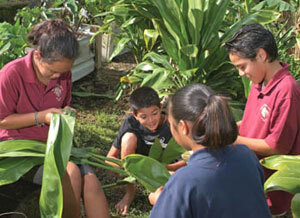 The University of Hawaiʻi at Hilo’s Ka Haka O Keʻelikōlani School of Hawaiian Language runs the only laboratory school program in the U.S. taught through an indigenous language. The main charter school, Ke Kula ʻO Nāwahīokalaniʻōpuʻu in Keaʻau, is located at the site of a former private Christian academy purchased by the Office of Hawaiian Affairs for the nonprofit ʻAha Pūnana Leo to support development of Hawaiian medium education. ʻAha Pūnana Leo refurbished the dilapidated buildings with the kokua of parents; UH Hilo pays no rent. "Hawaiʻi as a whole has the most developed program in teaching and revitalizing a Native American language," says William H. "Pila" Wilson, chair of Hawaiian language and Hawaiian studies at UH Hilo. "No other community in the U.S. has a program taught through a Native American language beyond grade 8, although there are a number who are planning to do so." Founded in 1997, Nāwahī is three schools in one—a preschool run by ʻAha Pūnana Leo; a K-6 charter immersion school called Nāwahī Iki or "small Nāwahū;" and "Nāwahī Nui" or "big Nāwahī," which teaches secondary students in Hawaiian under the administration of Hilo High. Nāwahī has 232 students and employs 21 K–12 teachers. Its mission is to secure "a school community built upon culturally rooted principles that reflect love of spirituality, love of family, love of language, love of knowledge, love of land, love of fellow man and love of all people." Nāwahī has been, by all accounts, a resounding success. It boasts a 100 percent graduation rate since its first graduating class in 1999. Eight in 10 students go to college—and not just the UH system, Wilson says, answering critics of immersion who suggest that students taught in Hawaiian will lack the written English skills needed to matriculate and assimilate into other institutions of higher education. "We have students who have gone to Stanford, Loyola-Marymount, Seattle University and the University of Northern Arizona. A student who moved from Nāwahī to the mainland in grade 9 is now in a doctoral program at Oxford."